It's the silence that so many remember about April 1997. A hush choked the air where there should have been a scramble of sounds — tires chewing gravel roads, dogs barking, machinery preparing for spring seeding, voices on coffee row. Even the birds were gone. 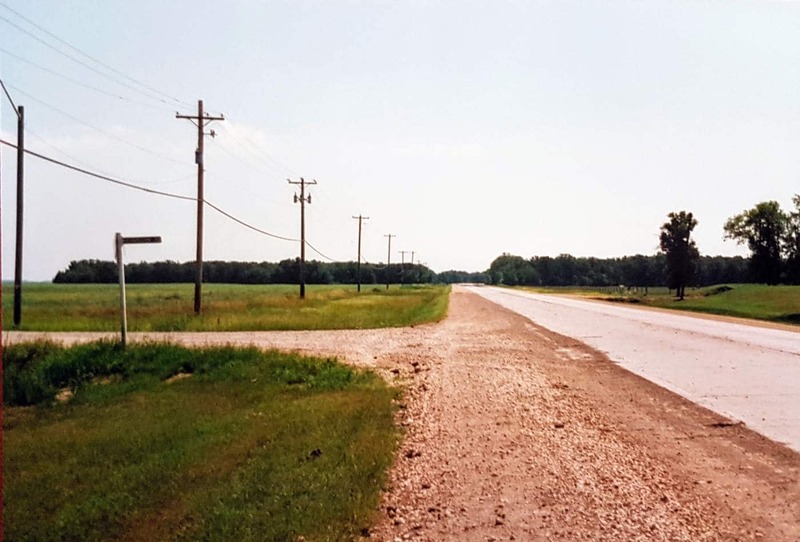 More than 22,000 people had been chased out of the Red River Valley, turning some 20 southern Manitoba communities into sudden ghost towns. What there was, was water. Plenty of it. It spread across the flat farmland like a shadow, when clouds swallow the sun. "It's an eerie feeling, especially in the evening. 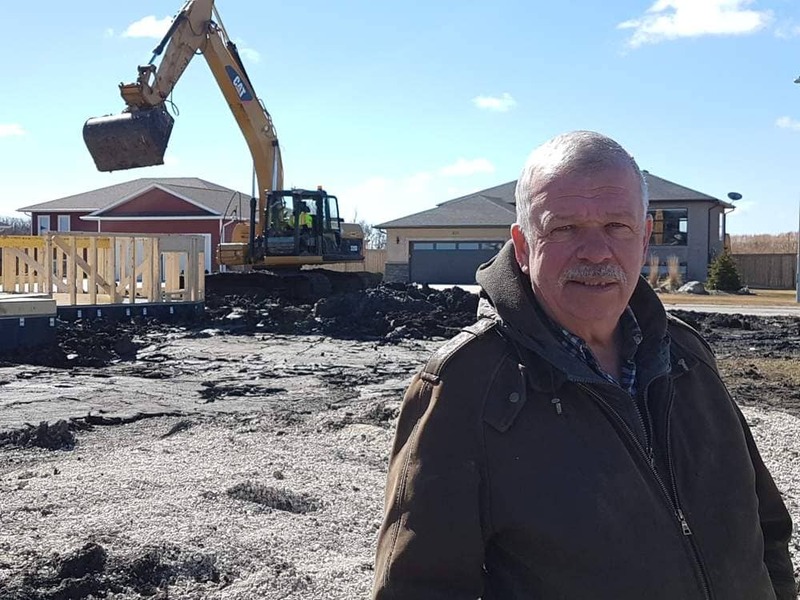 You could hear things bouncing against the water," said Bob Stefaniuk, the former mayor of Manitoba's rural municipality of Ritchot, which straddles Highway 75 and is home to several communities south of Winnipeg, including St. Adolphe, Ste. Agathe, Ile des Chênes, Glenlea and Grande Pointe. "Instead of green and black for fields and roads, it was all the same colour. Everywhere. The houses and buildings that had ring dikes or sandbags would stick up like islands. "You feel helpless," Stefaniuk said. "Mother Nature's taking charge and you're just going to have to accept that." 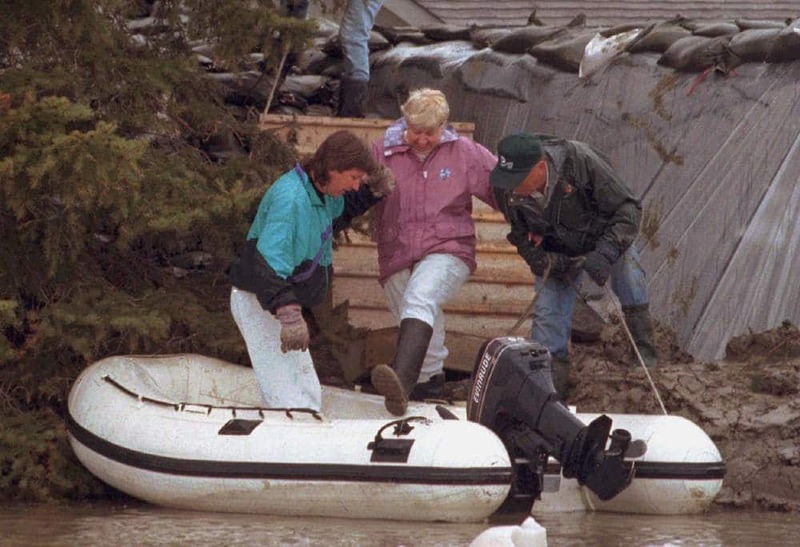 This month marks the 20th anniversary of the Flood of the Century, the most severe in the valley since 1852. At the height of the flood, the Red River was the largest river in North America, covering 1,840 square kilometres of land — an area equivalent to the size of Prince Edward Island. At its widest, just south of Winnipeg, the murky tide measured 42 kilometres from west to east, a sea making its way north to Lake Winnipeg. The flood was the knockout punch in a string of blows delivered by Mother Nature over the preceding months. It started with heavy rains that saturated the soil in the fall of 1996. The rains were followed by an unusually long and cold winter, which brought four blizzards. People in southern Manitoba were ready to greet the sun and see the brown earth when the melt finally came in late March. That's when Mother Nature curled her fingers into a fist and took another swing. On April 5, a vicious Colorado low roared into the province. It was the start of the fourth, and biggest, of the winter's blizzards. Some 50 centimetres of snow fell on the Red River Valley, from Wahpeton, N.D., all the way to Winnipeg and farther north. The storm closed every highway and school in southern Manitoba. 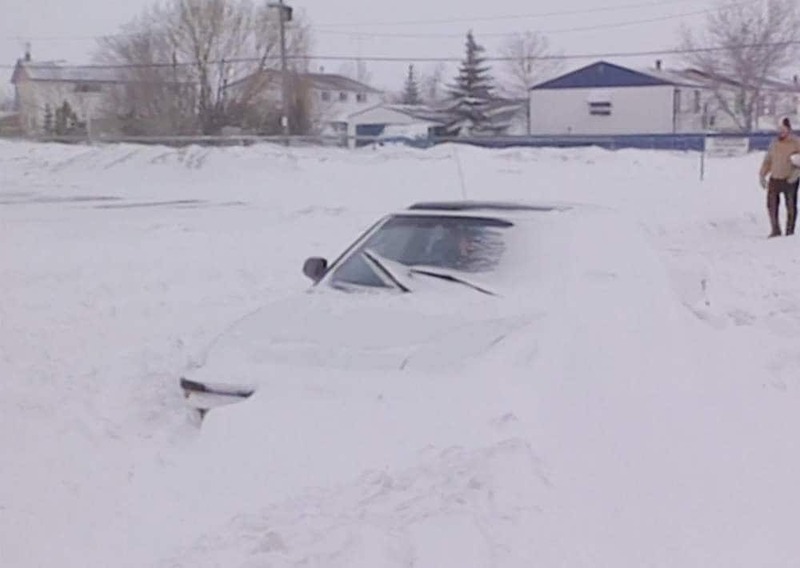 Vehicles were stuck and abandoned, or fully buried in drifts. After about a week of February-like cold, spring temperatures returned. The snow grew wet and heavy, snapping power lines and caving in the roof of the Sears warehouse in Winnipeg. The snow melted fast, and the ground, already sodden from the fall's rains, couldn't absorb the water. The blizzard had more than doubled the spring runoff levels, and as temperatures rose, so did the river levels. Everyone knew a flood was coming. It wasn't clear yet just how bad it would be. The Red River always swells in spring as it flows north with the thaw, gathering meltwater from tributaries along its 885-kilometre route — from Wahpeton, through the centres of Fargo, Grand Forks and Winnipeg, before emptying into Lake Winnipeg. In 1997, the river became a beast and its shallow banks couldn't contain the torrent. 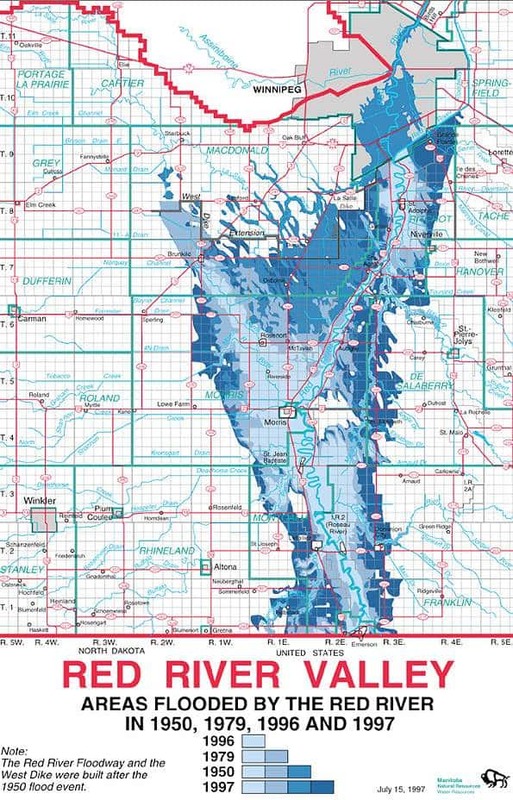 The water spread across the Red River Valley, inundating virtually everything in evacuated Grand Forks, N.D., where the river crested at 54 feet, easily overwhelming dikes constructed on a 49-foot flood crest estimate from the U.S. National Weather Service. In addition, a fire in downtown Grand Forks on April 19 engulfed 11 buildings and 60 apartment units as firefighters struggled to reach the flames on the flooded streets. 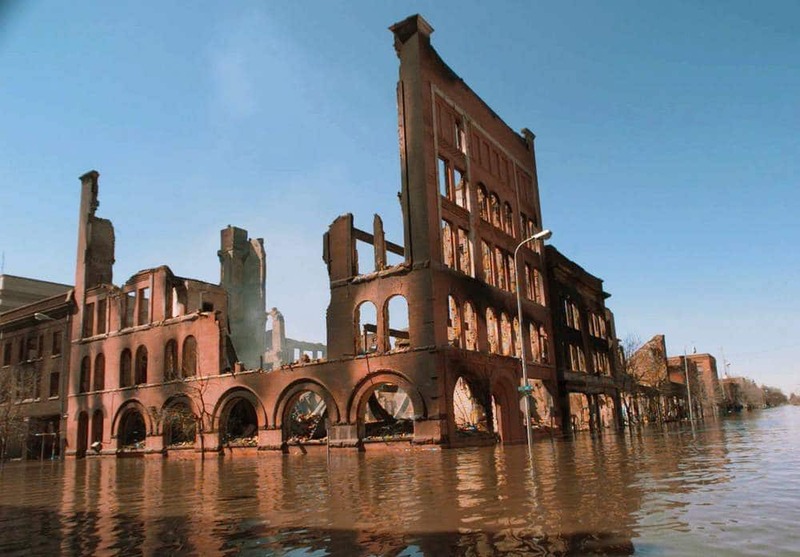 Manitobans were glued to the eerie images of flaming buildings in a sea of muddy water. 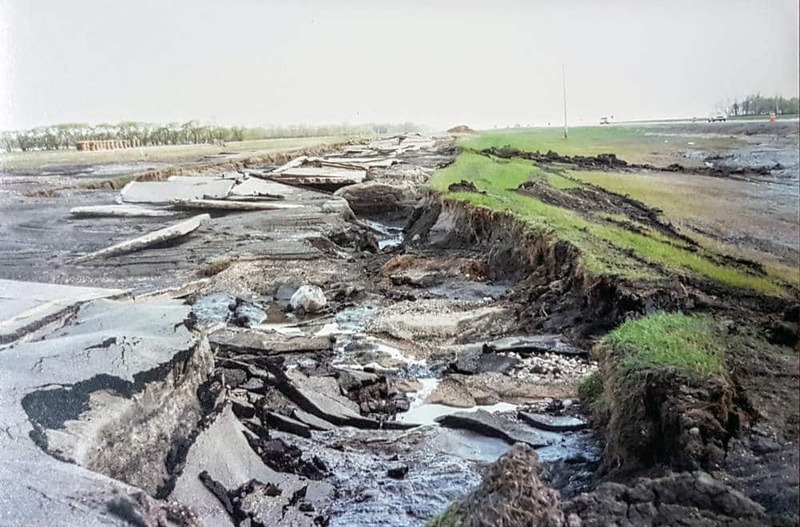 The Manitoba government and communities in the Red River Valley north of the border scrambled to build up the ring dikes that had been built around the region's towns after lesser floods. The province called in the Canadian Forces to help, while the RCMP and the Manitoba Department of Natural Resources began to evaluate the danger and to prepare towns for evacuation. Walls were built of sandbags, of mud, of stone, of school buses and crushed cars — anything to impede the water. As the Red River crawled north across a plain that is an ancient lakebed, it grew, joining with other cresting, engorged rivers and creeks. It swallowed entire farms and increased in depth, lapping at the top edges of road signs. Richard Brault, an RCMP constable whose district was the Ritchot area, switched from a cruiser to an all-terrain vehicle, then to a boat, and eventually to a helicopter, as the flood grew. "It was unbelievable to see that much water," Brault said about the view during a helicopter patrol. "Water all the way down to Emerson." On April 23, the province ordered a massive evacuation of communities in the flood path: Emerson, Morris, Ste. Agathe, Letellier, St. Jean Baptiste and St. Adolphe. 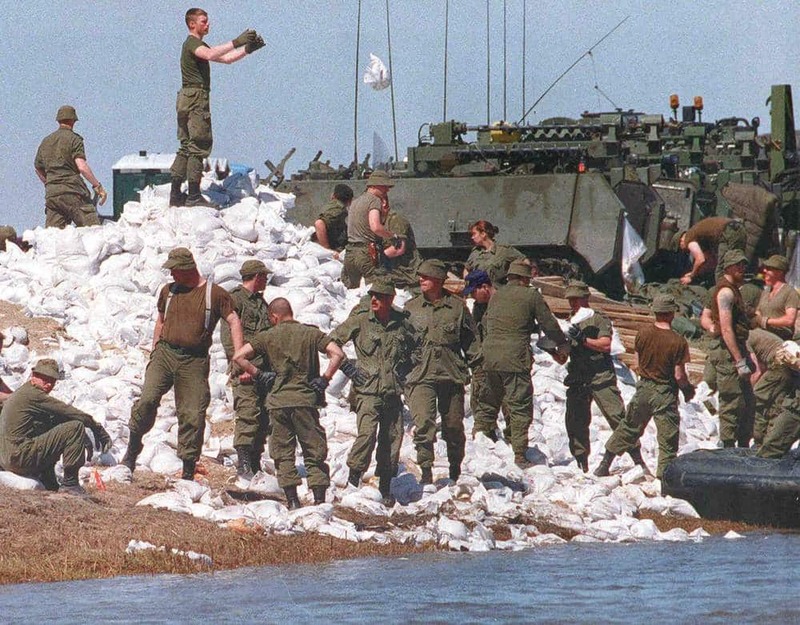 As water began to engulf roads, thousands of Manitobans were led out of their communities by the military, heading to Winnipeg, Steinbach and Selkirk — anywhere that stood a chance. Only small teams of officials — municipal leaders, military, RCMP — stayed back to monitor dikes and guard against looting or anyone who tried to return to check on property. "I went many days with no sleep," said Jeannot Robert, who was then a councillor for the rural municipality of Ritchot and among those on dike duty in Ste. Agathe. "Now and then, you had time out for a few hours, and then get back to work. But everybody else was doing the same thing." Most dikes held, leaving low-lying islands of dry communities in a vast new sea. Aerial views showed dots of individually diked houses in rural areas and larger islands of protected towns. 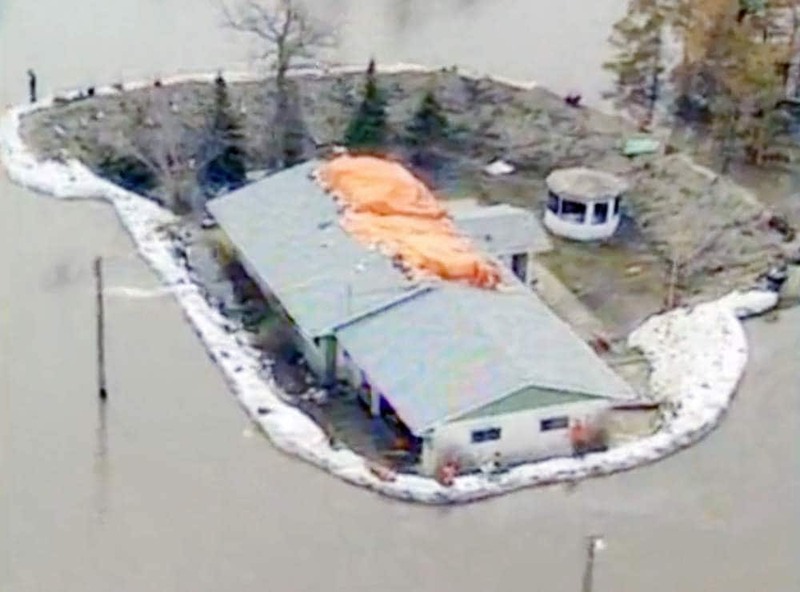 A home in southern Manitoba sits lower than the water level but remains dry thanks to a wall of sandbags around it. Those without protection loaded up their most important belongings and fled before the deepest water arrived, or were forced to their rooftops to await rescue. More than a few times, Const. Brault and a team of soldiers pulled up to a home or a barn — an arm's reach from the eaves — and helped stranded homeowners into a boat. Some 350 farms were impacted, with most finding dry, temporary placements for their horses, cattle, sheep and other livestock. But drenched and muck-covered fields left behind after floodwaters receded meant a shortened growing season — if any at all. Some refused to leave, and Brault said he refused to force them out unless their lives were endangered. "I would stop in, make sure they had food. I was first there to help and provide assistance," he said. "Once they felt things were out of their control, they could call us and we'd help them leave." Neighbours worked with neighbours, desperately sand-bagging homes, pumping out basements and moving belongings to rooftops. Many chose to leave after a while, and when they did, it was Brault and other RCMP officers, the military and an army of flood-fighters who helped them out of the flood zone. Sometimes, people tried instead to get in. They wanted to know what was happening to their homes, Brault said. They were almost always spotted by helicopter crews, who directed boat patrols to them. Some, though, were turned back by waves before the RCMP or military reached them, Brault said. "There were days the waves were three feet high out there." Only once did he bring someone back into a town: a man who was returning to bring medication to a neighbour still in the flood zone. "When he saw his own house, there was three feet of water through the main level. He just started crying," said Brault. "Most people never saw behind the scenes. They only saw things after the water was gone. "I never took anyone back after that." 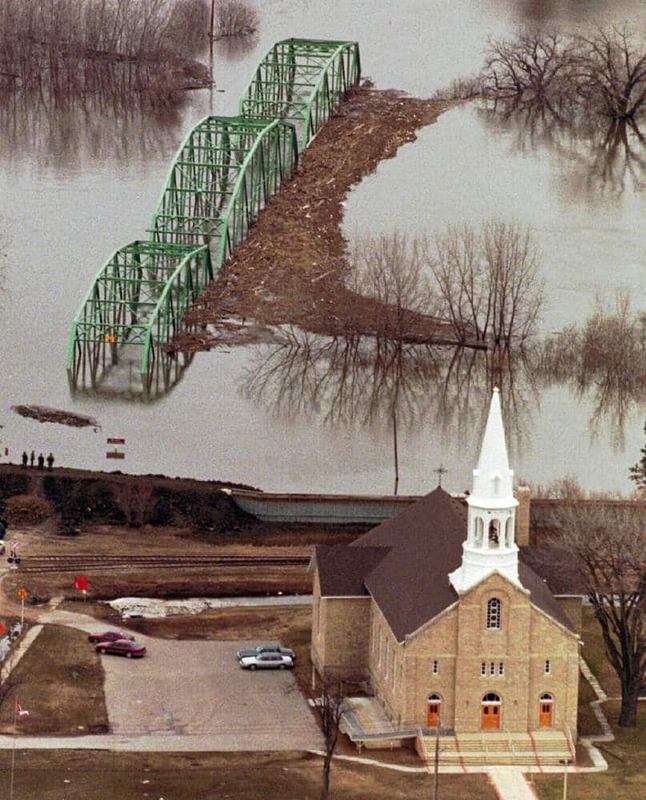 St. Jean Baptiste, just 30 kilometres from the U.S. border, was among the first Canadian communities to experience the flood. 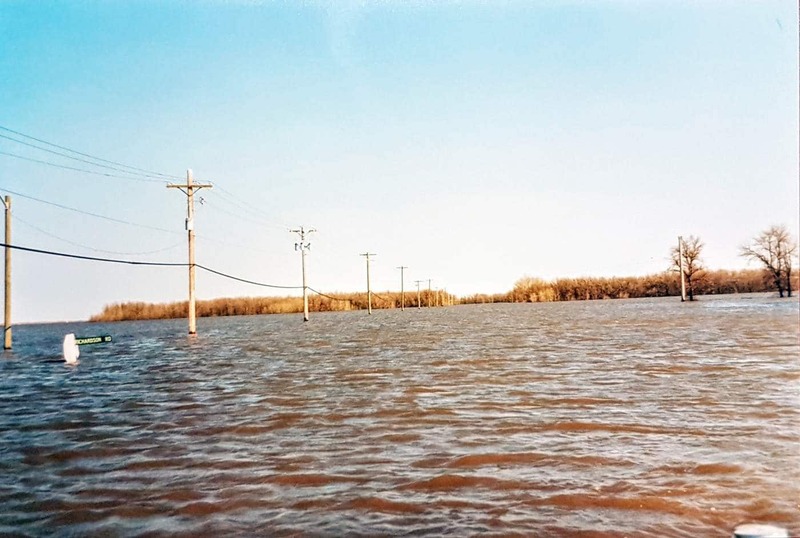 As the water surrounded the border town of Emerson — a community well-versed in flood protection — and moved north to St. Jean, the spotlight fell on Flo Beaudette, the reeve of the rural municipality of Montcalm. He worried about whether the dikes would be high enough. While the tiny French community was evacuated, Beaudette stayed and held his breath. "It was a very stressful time. The waves were at the edge of the dike, and he almost lost it at one point," said his widow, Celine. Beaudette, who died two years ago, carried a big weight, Celine said. His concern was for everyone — not just his own home and family. "I never got to talk to him very much during that time. He was so busy getting phone calls from government people and people who were evacuated, asking what was happening," said Celine, who went to stay at their daughter's place in Stonewall, just north of Winnipeg. Beaudette did check on his own property, which fell outside the St. Jean dike, and was instead surrounded by sandbags. As the water rose, he used a boat to get into the loft of his barn so he could still feed his chickens and collect eggs. "The only time he phoned me was to say the dike broke around our house and the water was coming in," Celine said. The couple had just finished a major kitchen renovation. They would have to start all over, cut open the walls and strip the home down to the studs. During her exile from St. Jean, Celine decided to fly to Ontario for a break that never really materialized. In the air, the pilot told passengers to look out the window at the "Red Sea." "I'd rather not," Celine groaned. In Ontario, her daughter was working for the Red Cross, assembling aid packages for Manitoba. "I could not get away," she said. 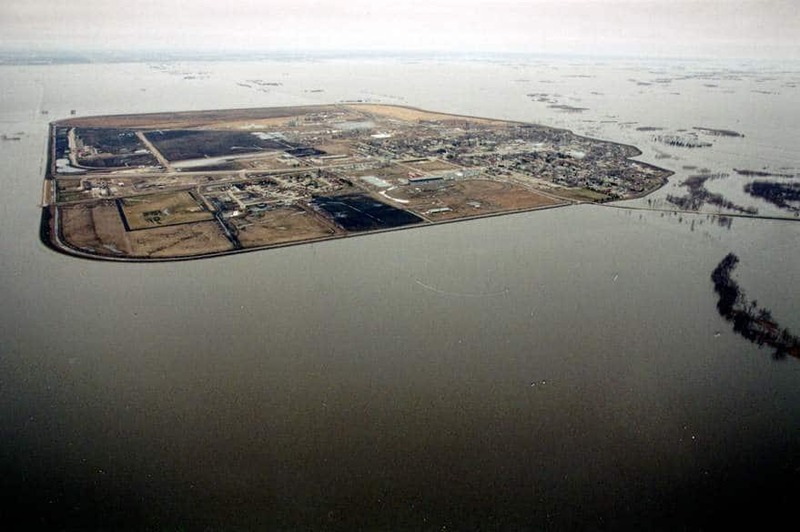 Although St. Jean was saved, many properties outside the ring dike suffered. "That flood was the drop that overfilled the cup. It was too much for Flo," said Celine. "He was a community person and it tore him apart to see the damages." Beaudette finished the term — his second as reeve — and left public office. Ste. 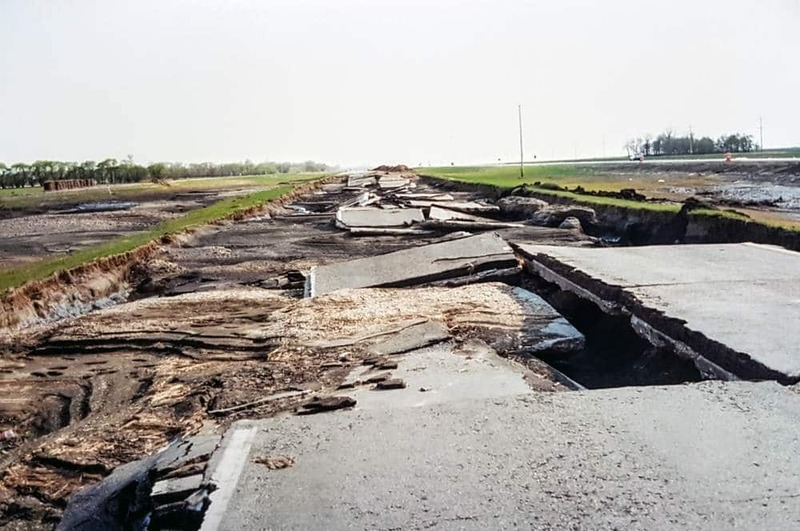 Agathe, 30 kilometres south of Winnipeg, sits at a slightly higher elevation than other communities in the Red River Valley, so it didn't have a permanent ring dike. A temporary sandbag levee was built around the south and east sides, where the Red River snakes past. The western side faced a vast, plaid patchwork of farmland — nothing anyone thought they needed to worry about. The water, though, left its usual path. As it moved north toward the town of 500, it continued to spread out across the prairie. "It came in through a natural watershed, jumped the Morris River and Highway 205, and came up from the west," said Jeannot Robert. At 4 p.m. on April 29, he looked south of town and reality hit. "There was so much water coming ... Then I kind of knew. I said, 'We're in trouble.'" There was a scramble to build a dike to close off the western side, but with the few flood-fighters left, it was lower than anywhere else. And unfortunately for Ste. 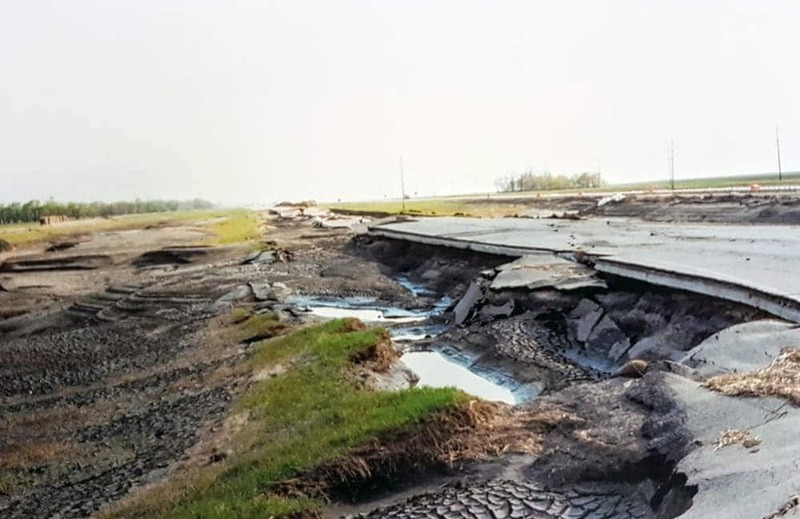 Agathe, a new wall — an emergency 42-kilometre-long dike extension that snaked all the way to Brunkild — had just been built northwest of town to protect Winnipeg from the same threat. Any water that pushed through the western quilt of farmland hit that wall, where it gathered, grew and turned back toward Ste. Agathe, propelled by winds that had been gusting all day, creating white-capped waves. "It was rolling through the fields," said Robert, who remembers watching in awe — until the leading edge of water soaked his shoes as he stood on Highway 75, jolting him from his trance. He raced back to town, where he and other flood-fighters grabbed their belongings and "took off." "There was a heavy current so we got out of there," he said. Around midnight, the water rushed into town. Every home, except maybe four, was damaged. Brault and the military did a final patrol of the inundated town — "We had to make sure nobody was left behind" — and found three marines stranded in Ste. Agathe with a trailer of unfuelled Zodiac boats, sitting in a parking lot behind a building. "They had no idea where the roads were," said Brault, who climbed into their pickup truck and drove out as the military followed in a massive six-wheeled military vehicle. "There was almost no landmarks ... The roads were gone, the yards were gone," he said. "But I know this area inside and out. I could get by blindfolded." The town of Aubigny, just south of Ste. Agathe, was also swept up in the floodwaters with no permanent dike system to protect it. Brault knew there was a dip in the road ahead and it would be "nip-and-tuck" to get the pickup through. Water started pouring over the hood of the vehicle until it stalled. He climbed onto the roof and into the military vehicle when it came alongside. 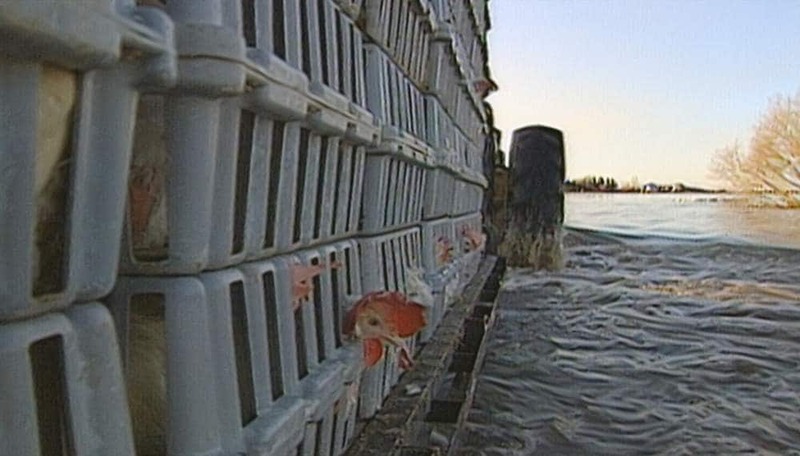 Soldiers waded into the cold water to transfer the trailer. Robert ended up staying in the Steinbach area, east of the flood zone, but returned every day to Ste. Agathe to patrol "all over town" by boat. "It felt kind of weird to be driving through all the streets in a boat," Robert said, describing passing houses and street signs standing in a lake. "It's like a dream." During his patrols, he noticed a couple of dogs that had been left behind in one home. Robert boated to his home, retrieved some leftover roast and fed the dogs, who were eventually rescued and taken out of the deluged town. Brault, too, continued boat patrols of rural areas, and remembers how surreal it was. While soldiers steered the boats, he'd tell them when to lift up the outboard motor, so it wouldn't clip the top of a fence. 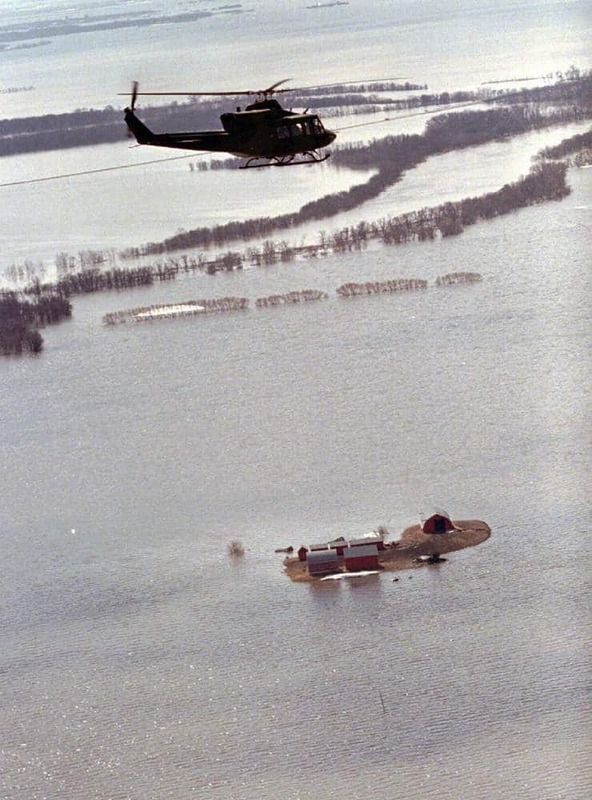 Since 1968, Winnipeg has had the Red River Floodway to protect it from floods like the one that washed through the city in 1950. When its gates are open, the 47-kilometre-long channel diverts part of the river's flow around the east side of Winnipeg, from an inlet near St. Norbert to an outlet near Lockport. 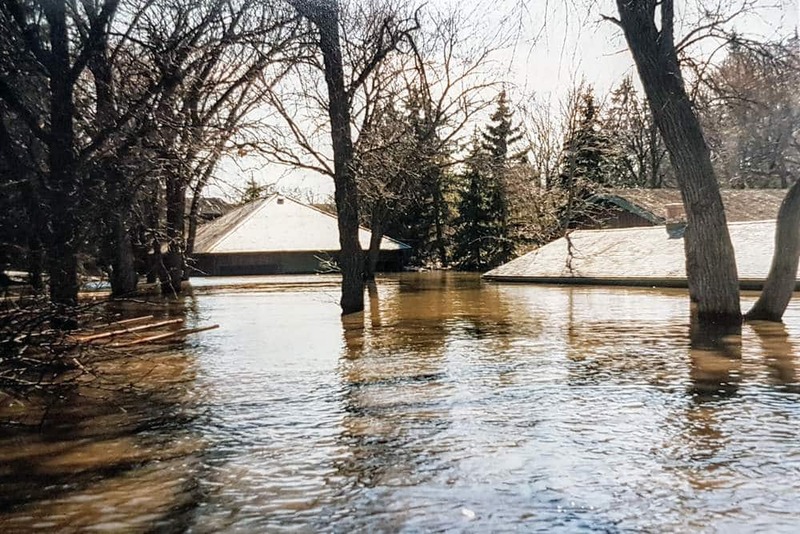 But in 1997, as the floodwaters widened, officials feared the water would bypass the city's main defences by spilling into the La Salle River southwest of Winnipeg, which feeds back into the Red River north of the floodway gates. Although there were dikes closer to the Red River, flood officials feared they didn't extend far enough into the prairie. The Brunkild extension — nicknamed the Z-dike for its zigzag pattern — was constructed in a matter of days to block in the La Salle. Hundreds of loads of crushed rock and clay were trucked in to build the dike to a height of 26 feet (eight metres). 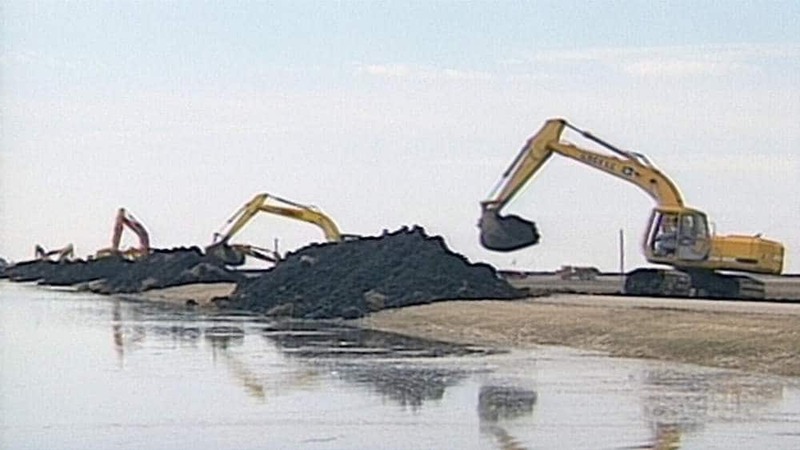 "Pretty much every large truck and bulldozer available in the province was seconded to get it built," Brault said. "We had people from Swan River (nearly 500 kilometres away) coming down with machines." The construction was non-stop for weeks, with flares shot into the night sky to allow work to continue. 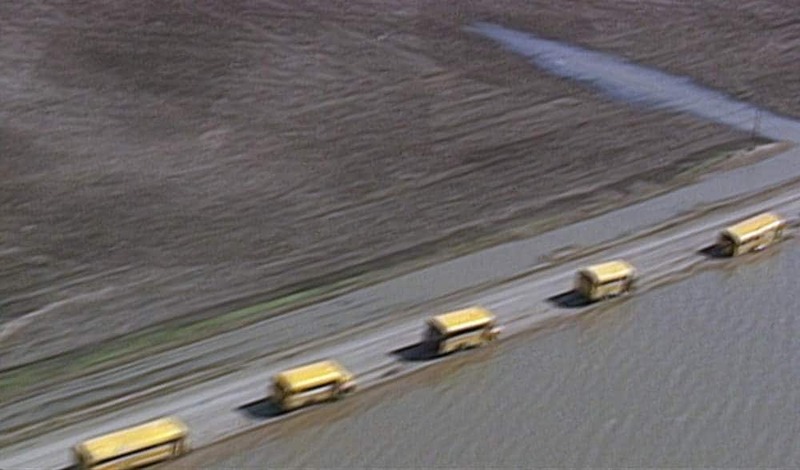 The bodies of old school buses and other junkyard cars were lined up, reinforced with hay bales, to act as a breakwater in front of the new dike and to protect it from pounding waves blown up by Prairie winds. The $10-million project was done before the floodwaters arrived — and worked perfectly. While many blame the Z-dike for the devastation in Ste. Agathe, Robert said he understands provincial officials had little choice. "Their concentration was to save Winnipeg, which was the right thing to do. Had Winnipeg flooded, it would have been a total disaster for the province," he said. The province later dismantled the Z-dike. And Highway 305, which the barrier followed for much of its route, is now raised above 1997 flood levels and serves as a permanent dike. Despite all the effort being made to protect Winnipeg, it was touch-and-go for many in the city. Some 2,320 homes and businesses were evacuated, displacing an estimated 9,000 people. And the water came close to overwhelming the floodway, which was designed to protect against a flow rate of 60,000 cubic feet per second. The rate in 1997 was 63,000 cubic feet per second at its peak, which came late on May 3 and early on May 4. The water was also fast-moving in parts of Winnipeg, through its rivers and storm-sewer system. Adam Young, 14, was playing with friends by a water-filled ditch near a culvert. The rush of the water through the culvert, which was connected to the storm sewers, caught Young and pulled him in. Friends tried to hold on, but the force of the water was too strong and Young disappeared. His body was found weeks later. 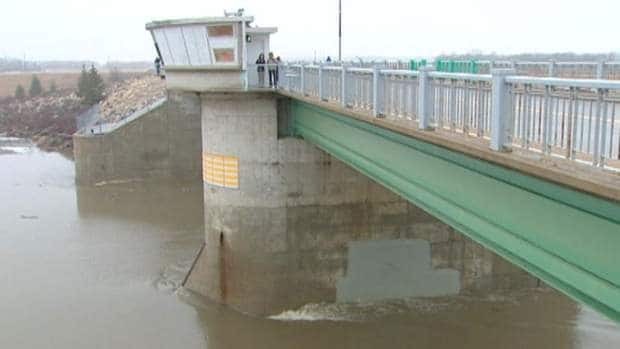 While the Red River spread across Manitoba, inside Winnipeg, its level reached 24.5 feet above normal winter ice levels at the James Avenue pumping station. Without the floodway, the crest would have been 35 feet — four feet higher than in the 1950 flood, which devastated much of the city. Every neighbourhood would have flooded, the province estimated. Instead, a total of 54 city homes suffered flood damage. 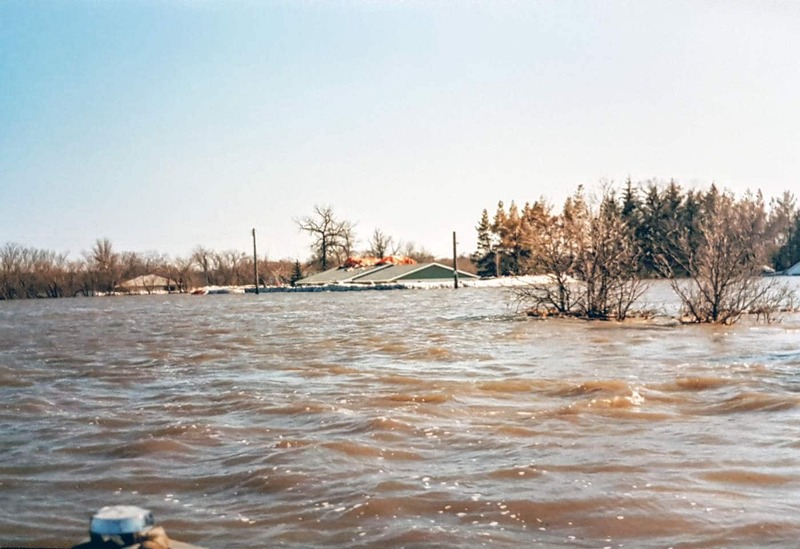 To prevent the water from rising higher than it did in Winnipeg, the province broke legislated operational rules for the floodway, allowing for higher flow. But it came at a cost for communities south of the city. As the river backed up at the floodway gates, it washed through Grande Pointe, where 100 of the bedroom community's 150 homes were damaged. 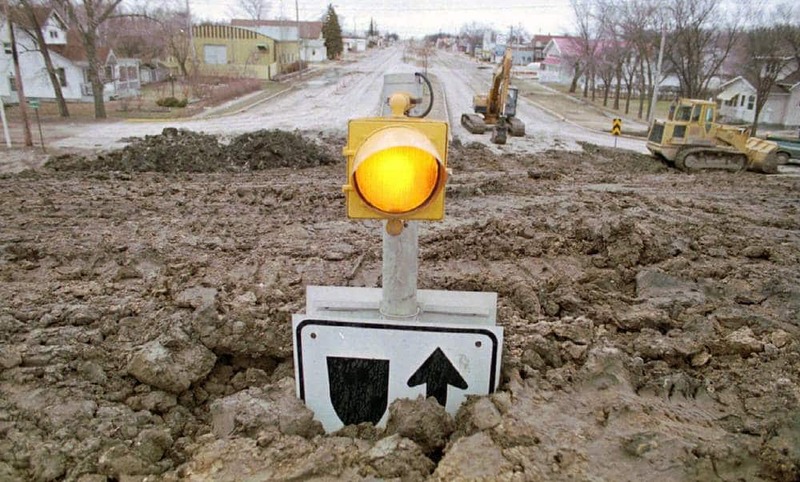 The province has legislation in place to compensate individuals impacted by the artificial flooding, but the amount of damage and the effort required to make a claim became the next challenge for weary Manitobans, leading to rallies outside the legislative building. "Some of them had more grief from the government than from the flood," said Brault. "It turned out the helping hand of government was not helping so much." 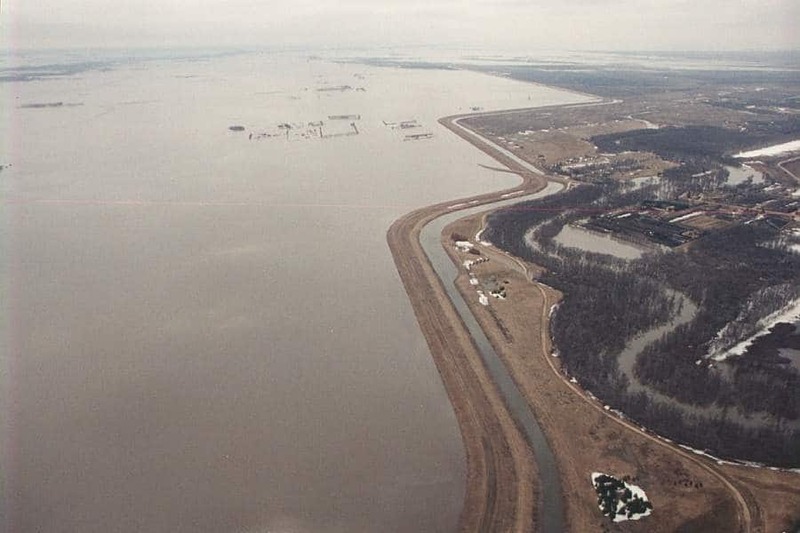 After the flood, the province embarked on a massive project to expand the floodway, enabling it to accommodate greater volumes of water. The work, which started in 2004, was completed in 2014 for $627 million. 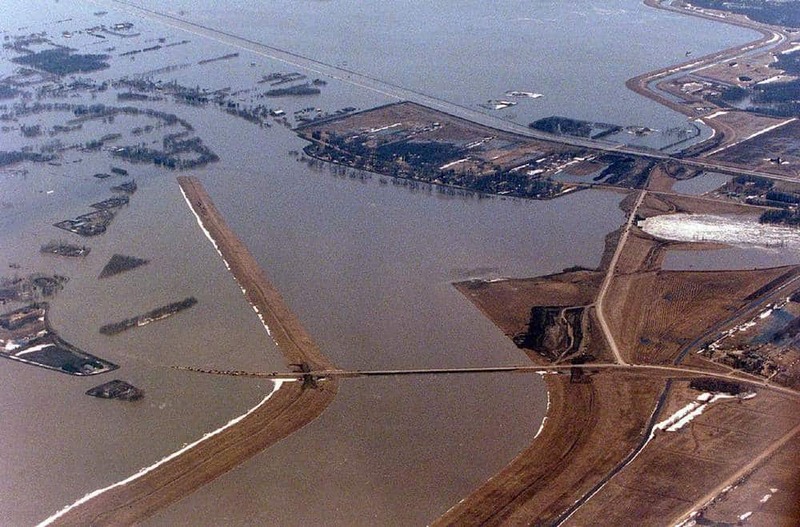 In comparison, the original floodway was built between 1962 and 1968, and cost $63 million. Evacuees who had left their homes on April 23 were allowed to return in the second week of May, after the floodwaters receded. The removal of dikes began at the same time, while the military packed up and rolled out on May 13 to cheers, salutes and waving thank you signs from grateful Manitobans. "When people got back into their homes, oh what a nightmare. What a mess," said Celine Beaudette. "Houses were full of gumbo. The floors were covered." Near Ste. Agathe, the force of the water washed away the gravel bedrock of the train tracks outside of town and lifted the rails. It buckled and ripped apart Highway 75, washing away large chunks of the roadbed. "You could have fit a semi into there," Brault said of some of the craters left behind. "We never found part of the road. It was just gone." "It was a tremendous experience," said former RM of Ritchot mayor Stefaniuk. "I hated to see people lose their homes, but I was amazed at the extent they would go to protect their homes and belongings. "And then to see their heartbreak when they lost it, that was difficult. But the human spirit is very, very strong." Like ants rallying to rebuild after their hill has been kicked, Manitobans have rebounded stronger and wiser to Mother Nature's forces. Ste. Agathe is now protected by a ring dike and has grown dramatically. In 1997, there were about 105 homes. About 160 have since been built, with another 200 still planned, said Robert, now a contractor for Belle Rivière developments. "Some people were saying it will be tough to rebuild Ste. Agathe after a big flood like that — people will not want to come in to live," he said. "But that didn't happen." Grande Pointe also has a permanent dike, disguised as an elevated stretch of Highway 59. A new diversion channel has also been created to redirect high water flows into the expanded floodway. As for Celine, she now looks out the window at the Red River and it doesn't bring her stress. She moved to Winnipeg after her husband died and lives on the third floor of a condo with a window facing the river. "I know it won't reach me," she said. "I just watch it go by and I can enjoy it now. "It's a different relationship — a much better one." • If the 8.1 million sandbags filled during the flood were set down end to end, they would stretch from Winnipeg to Vancouver. • At the crest, the amount of water roaring toward Winnipeg could have filled an Olympic-sized pool every second. • The floodwaters covered 141,900 hectares of cultivated land and affected close to 350 farmers, an inundation that caused more than $500 million in damage. 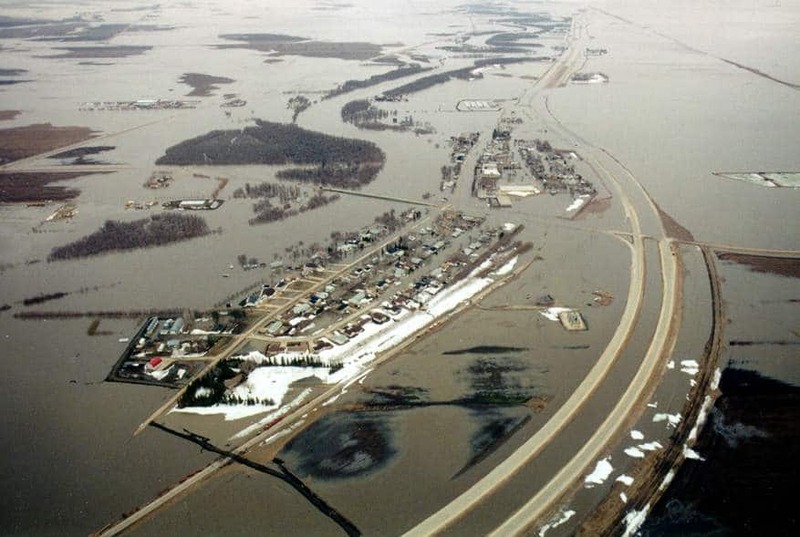 • About 1,000 homes suffered flood damage in Manitoba, 100 of them beyond repair. 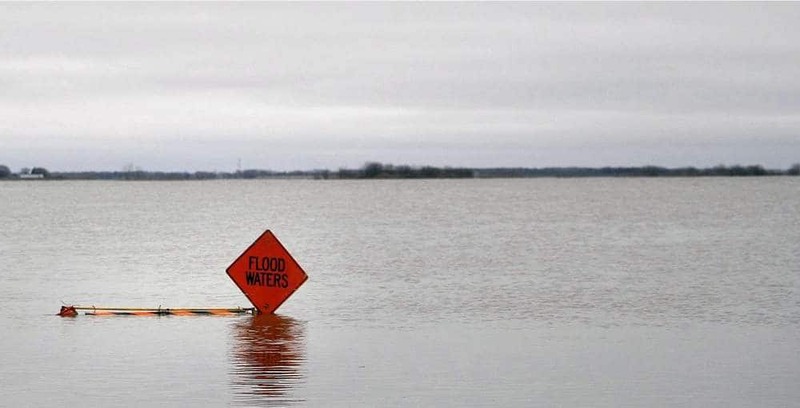 • Damages avoided due to the floodway and emergency diking were estimated at $6 billion. 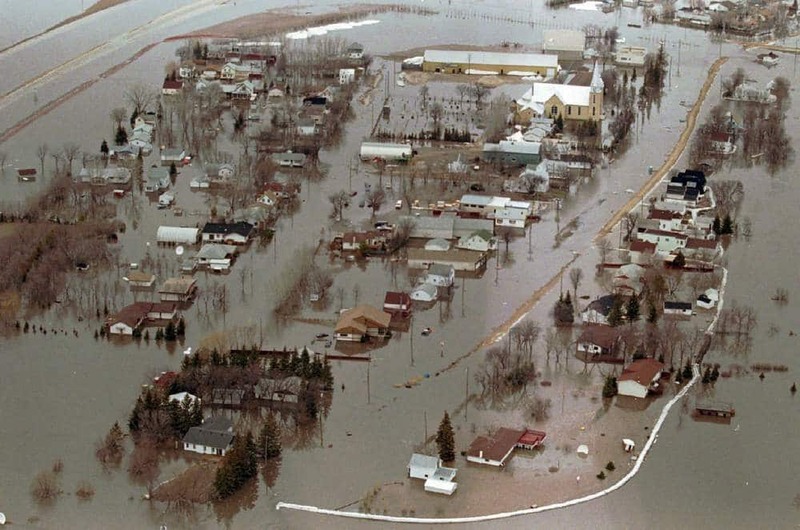 • A total of 28,000 people were evacuated from the flood region: 6,000 in Winnipeg and about 22,000 from rural areas. • More than 7,000 military personnel were employed for 36 days to help prevent flood damage and relocate evacuees. 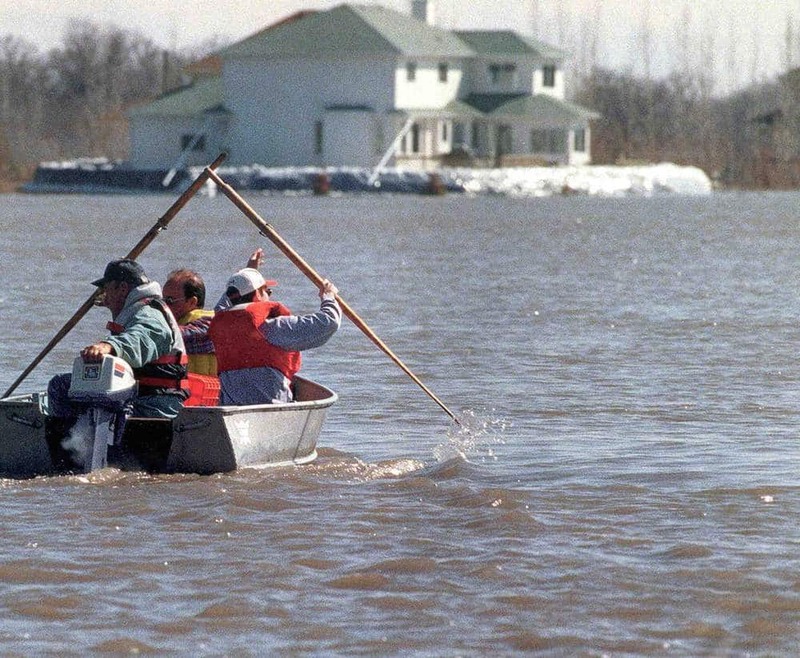 • The first of the evacuated Winnipeggers were allowed home on May 8, 1997, four days after the crest. • Residents of Ste. Adolphe, Morris and St. Jean Baptiste had to wait until May 18 to go home. • When evacuees returned home, flood workers escorted them to a designated centre to register; escorted them to their homes for inspection, making sure they had water and gas; and gave the residents occupancy tags to be worn whenever they were out. 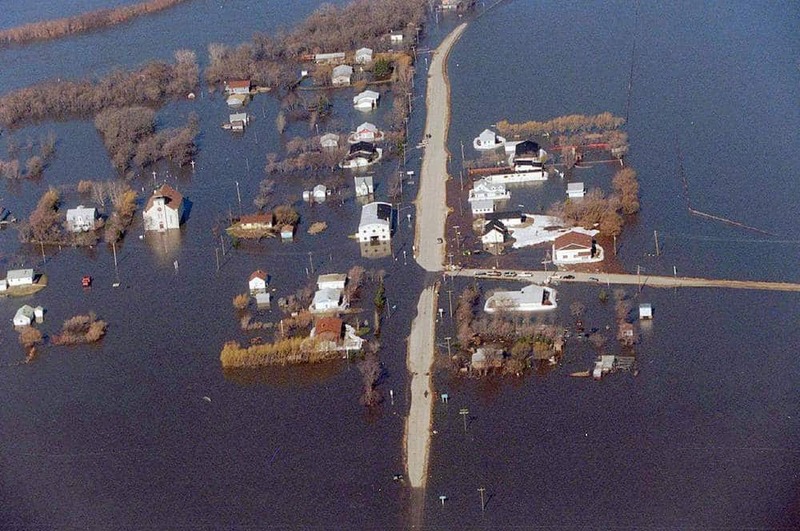 • By late September, some Manitobans still couldn't return home due to extensive flood damage. Instead, they spent the winter living in mobile homes and trailers. 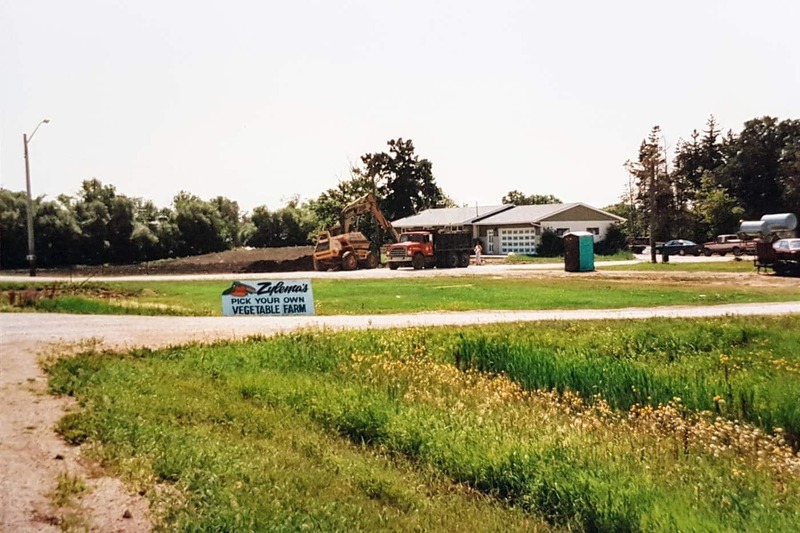 • In 1997, the Manitoba government offered homeowners a maximum of $100,000 in flood compensation, but some complained that wouldn't cover the structural damage to their homes, let alone the cost of furnishings. As a result, the government did away with the cap on compensation.